Kids' toys can be good for mindfulness. Here's three for under $50 each. The under-$50 toys that inspire a mindful child (and parent). I know we’re all looking for mindfulness. But it isn’t easy to find the space to meditate eyes shut, with your legs-crossed on the floor when you’ve got kids running around your house at a million miles an hour. And it’s certainly not easy to find inner peace when your house is being turned upside down and you’re in the middle of your 1000th game of hide and seek. Finding space for your brain to rest is really, really difficult. When I’m not at work, I’m at home helping my wife with the kids (which I love, but I’ve gotta tell ya, it’s busy). I’m sure you’re in the same boat. You’re answering work emails on your phone in between feeding your kids at the dinner table. Then you get a million Instagram notifications of people taking photos on their dinner. You feel like your head is going to burst. You need some downtime to let your cerebral cortex reload, but you also want to spend time with your kids. You want your kids to be engaged, learning and growing. What do you do? Play with your kids’ toys. Yes, the best option is to play with kids’ toys with them. Honestly, I’m amazed at how relaxing it can be to see my kids put the shape in the right space, point to where they live on map, learn how to stack blocks and discover new things in the comfort of our living room. As my two youngsters laugh and learn, I laugh and learn too. I found that with these three toys from Fisher-Price’s Laugh & Learn collection, an affordable and interactive range that my kids love. Got your head in a spin? Take a spin of this. Image: Supplied. This toy is a winner. My kids love it. As they spin the globe, like some all-powerful deity, tunes are played teaching them about the geometric principles that govern all of us. Spin after spin, my kids press one of the seven animal buttons and discover lots of interesting things about the world. Such as, that pandas come from China. That lions are native to the continent of Africa, not England. That South America is just a simple spin of the globe from Australia. Or how to say "hello" in Mandarin ("Ni hao"). 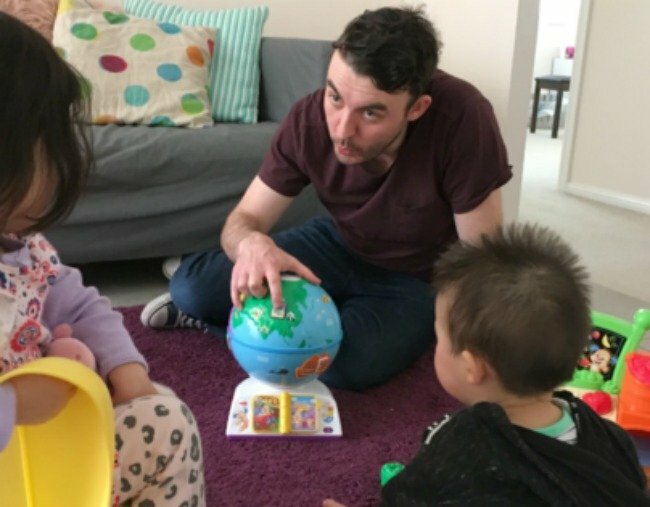 Using what Fisher-Price call their Smart Stages technology, this interactive globe is full of cool elements that encourage learning, fun and roleplay, including 100 sounds, songs and phrases. When I played with this toy, I quickly realised that I&apos;d forgotten almost everything from Year 10 Science and Geography. See, adults can learn something from kids&apos; toys, too. "This toy is a winner." Image: Supplied. Teaching kids hygiene can be a nightmare. Water gets everywhere. You can&apos;t remember if the kids have washed their hands before meal time. Fisher-Price have saved some of those hassles: the Let’s Get Ready Sink teaches kids about brushing their teeth, combing their hair and the all-important difference between hot and cold taps. Kids can learn how to use soap and listen to a catchy tune at the same time. There&apos;s a cup where your kids can put their toy toothbrush. It’s art imitating life at its best. When you switch to the sound effect function, kids can learn what each part of the toy can do in real life. They&apos;re learning about the value of each activity as they play. And that&apos;s definitely worth the investment. Toddler turns global leader and supermarket superstar. Image: Supplied. My kids love this toy. And every parent wants their kids to love vegetables. It&apos;s literally a mini fruit market. How cool is that? This toy teaches kids about different fruits and vegetables through colour association with coloured shape blocks. Like the other toys with Smart Stages, the levels are adjustable so it gets more involved as they grow. There&apos;s even a shopping list for them to check off – thank you, grocery gods! My kids learn a lot from this toy. And us big folk can learn something, too. Did you know a tomato is a fruit? Thanks to the Fruits & Fun Learning Market, I know a brand new fruit. How good is that? So, folks, these three toys prove what I was saying about mindfulness. Go on, play. You&apos;ll relax. You&apos;ll watch your kids have fun. And you&apos;ll learn. What&apos;s your favourite toy for your kids&apos; learning and laughs? Tell us below!